While human rights and freedoms are generally upheld in Canada, there was a law against “Blasphemous libel” until December 2018. Passing Bill C-51 on 11 December 2018, the Senate repealed the “blasphemy” law, along with a number of other reforms aimed at removing “archaic” legislation. Section 296 of the Criminal Code said that “Blasphemous Libel” is an indictable offence and is punishable with imprisonment for a term not exceeding two years. The provision provided a “good faith and decent language” defence, however it had been used to threaten prosecution against satire and criticism. A priest attempted to file charges against a cinema that screened Monty Python’s the Life of Brian in 1979, but Ontario’s Attorney General refused to prosecute. Strong constitutional protections probably made the prison sentence truly unenforceable, but the law had remained on statue since 1892. In its response, the Government stated that the section was under review as part of a broader program of justice reform. The Government introduced a bill to repeal the section in 2017. In May 2017, the Ministry of Justice announced Bill C51 (2017) which included among other things two proposed abrogations of interest: article C296 (blasphemy law) and article C176, an article that specifically criminalize threats and violence against the clergy while other articles already cover threats and violence against any citizen. While the expected abrogation of article C296 has not met any resistance so far, the expected abrogation of article C176 triggered a reaction from the Archbishop of Toronto who argued that its removal would be an assault on freedom of religion. Several people have been arrested since the 1980s under section 176(2) of the Criminal Code for protesting in or near churches. This section criminalizes “disturbing religious worship”. One case made it to the Supreme Court of Canada after six members of a small Catholic church were arrested for kneeling instead of standing to receive Communion. The Court overturned the conviction but upheld the section. Protests that are “brief, essentially passive in nature and are voluntarily desisted from, upon request” were deemed legal. Following this a self-described “dissident” Jehovah’s Witness was repeatedly arrested for protesting outside Kingdom Hall’s between 1983 and 1999. The bill to repeal section 296 initially included a repeal of section 176, but MPs on the House of Commons Justice Committee voted to amend, rather than delete, the section after pressure from religious groups. 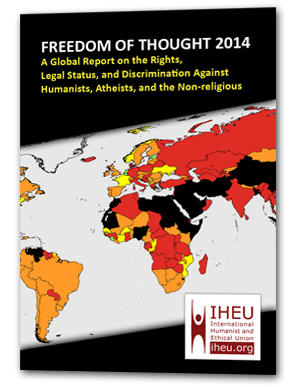 The repeal in 2018 followed a national campaign by CFI Canada and by Humanist Canada, who have been lobbying together to abolish the “blasphemy law”.